"This is my favorite chicken recipe. Everyone in my family loves this recipe and it is super easy!" Mix apple jelly, honey, mustard, cinnamon, and salt together in a bowl. 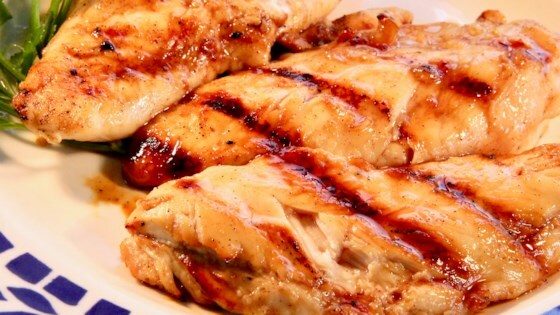 Brush chicken breasts with glaze. Place glazed chicken breasts on the preheated grill; cook, occasionally brushing chicken with more glaze, until chicken is no longer pink in the center, about 10 minutes per side. An instant-read thermometer inserted into the center should read at least 165 degrees F (74 degrees C). This recipe is sweet and simple. I made this as written and was worried it would be too sweet but it tasted good. I was pleasantly surprised. Thanks for sharing your recipe. We used Raspberry/Pomegranate Jelly instead of Apple, and loved it! I substituted orange marmalade and kept all the other ingredients the same. Rave reviews from hubby and kids. Thanks ~ this was so easy and I'll definitely make it again.